A case in point: Nehemiah was very nervous about meeting with the wealthiest, most powerful man on the planet. He was asking King Artaxerxes to fund his Jerusalem restoration project. But when it came time to make his appeal, this lowly cupbearer first looked up to the Person who really provides resources. At the moment of truth, Nehemiah lifted his heart and made The God Ask. In Nehemiah 2:4 he describes the exchange: "Then the king said to me, 'What would you request?' So I prayed to the God of heaven." Instead of going into appointments fearing what your fellow man will say, you can have confidence that God is superintending the whole process. This book will help you embrace the fact that this is not a Man Ask. No. It is a God Ask! 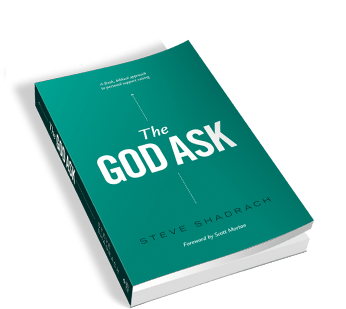 "Full of practical tools and biblical foundations, The God Ask turns our focus away from our fears and toward faith in God's abundance. Shadrach inspires us toward excellence, courage, and humility. A must-have resource for anyone engaged in support raising!" TOM LIN – Vice President and Director of Urbana, InterVarsity Christian Fellowship? “After twenty-five years of living on support, I finally got trained by Steve in this material and realized how much I was doing wrong! Steve’s practical suggestions and challenging perspectives produce results. I always recommend his Boot Camp for those going into full-time Christian work. Now it’s in written form! This is a must read for every person who seeks to raise their support to serve the King!" 11 You Can't. God Can.